Are you ready to make the switch to solar power? Have you gotten your property assessed for a solar power system? Do you have multiple bids from solar companies yet? It’s important to know that even though there are dozens of reputable companies that install home solar energy systems every year, you need to find the best company that meets your needs. One of the most frustrating calls we get at West Coast Solar is when a potential customer expresses their grievances toward another solar company that didn’t take care of them properly. Fortunately, our expert team has helped hundreds in the Sacramento area, and we’re willing to do whatever it takes to help as many people as we can. In this post, we’ll share when you should start getting solar power system bids for your home, when to get your property assessed for solar, and why it’s important to get multiple bids. You can read the rest of this blog series, too. If you’re ready to get started on your budget and solar energy system design, give West Coast Solar a call today! We service Sacramento, and we’re ready to talk with you! Otherwise, read this post to learn more. Question #5 – When should you attain site assessments and bids from solar companies? When researching solar installers, it’s important to keep a few things in mind. Experience, licensing, insurance, customer-service, and references. First, you want to find a company that has years of experience in the industry. For the most part, you don’t want to hire a company that hasn’t been around for that long. Second, you want to check to see if the companies you might use are properly licensed (if required by the state or local municipality). This will ensure you have someone who’s been deemed eligible to provide solar services to residents in Sacramento. Third, you want your solar power system installer to be insured. This protects them, you, and the project. There are various stipulations that go along with this, but you should ask for their insurance policy number and verify it before allowing them to do any work on your property. Finally, you want to ask for references and referrals from the company. This will shed some light on the solar companies ability to satisfy customers and their level of customer-service offered. 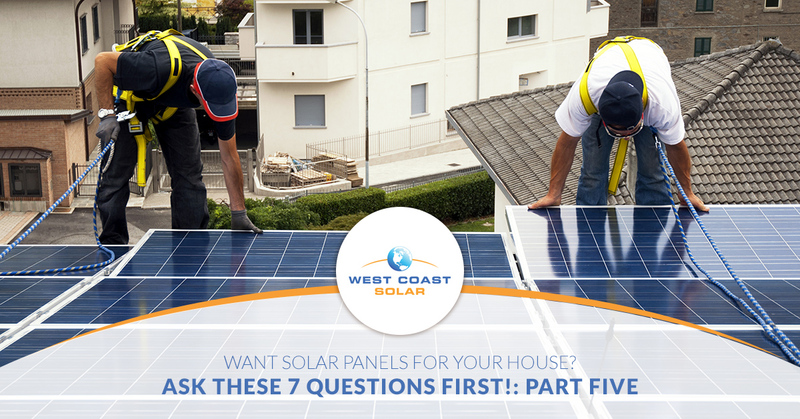 The short answer is as soon as you commit to making the switch to solar power. You want to know the size and type of system you can install on your property before you start getting bids. In most cases, solar companies will want to assess your property before giving a bid. For them, it’s better business to get you within range of the actual budget, then send you a number that’s either way too high or low and lose your business. You will find that some solar companies won’t come out to your property until you have financing secured for a system in the first place. It begs the question: How am I to get financing for a product and service I don’t know the price to? Great question. At West Coast Solar, we want to help you make the switch to solar, so we will come out and assess your property and get you an accurate estimate on how much a home solar power system will cost you. It’s no trouble for us to win your business and satisfy your needs. All we need is the opportunity. It’s relatively simple to get estimate prices on solar power systems; however, we know that customers want to get down into the pennies when it comes to bids. You can use various online quote tools to find prices accurate around the thousands and sometimes hundreds. Those tools will get you a close price, but they won’t give you an exact price. The best way to get a bid from a solar company is to call them, request a property assessment, and then work with them to solidify a number. Once this number is set, you can begin working on financing, unless you’re paying cash, and then get the system designed, built, and installed. Furthermore, you will want to do this process with multiple solar companies. You want to call, request assessment, and get a bid. You can use prior estimates to see if the other companies will compete, lower their prices, or offer something worth the extra cost in their proposal. A solar power system is a long-term investment in energy use and your life. Don’t take it lightly. Do your due diligence. Check the bids that you’ve received and make sure they don’t just show a general list of products or services with numbers out to the side. You want to know a few different things when you get an estimate from a company. The bid should clearly show the maximum and potential energy generating capacity of the system. This should be measured in Watts (W) or kilowatts (kW). If you don’t see this, request that the company who gave you the bid to provide an estimated monthly and annual energy production in kW or W. You will use this to compare to your current utility bill, to ensure the system you’re going to install can handle your energy usage. Each bid should give you information on hardware, installation, connection, permitting, sales tax (if any), and warranties. You can use this information to compare bids between companies. The primary metric will be the kilowatts-per-hour for each system. Also, different companies may use dissimilar hardware, which can change prices. At the end of the day, you want the solar power system that will power home, not the one that powers it 75 percent of the time but cost you less to purchase. You’d probably pay the difference in using traditional energy, anyway. Purchase the system that powers your home and more. How familiar is your company with the local permitting process and interconnection procedures? How many solar power systems have you installed in the last twelve months in my area? Can you provide references to prior customers in my area? Are you properly licensed, and do you carry insurance? What kind of warranties do you offer on your systems? Do the manufactures you work with provide warranties? Do you have any active judgements or liens against your company? What if I have an issue with my system in the first 12 months/ What will you do? Get A Solar Power System Bid From West Coast Solar! After servicing the residents of Sacramento for so many years, we know exactly how to get them the system they need when they call. We’ll come out and asses your property, determine the size of system that will fit, and then work our way backwards to your budget. We don’t try to sell you a system you don’t need, either. If your budget won’t cover the system you need, we’ll tell you. In most cases, we will figure it out. Give us a call today! In part six of this blog series, we’ll discuss solar power incentives you can take advantage of. Want to read the rest of the series? Start with part one!